Have you ever shared information and had the intended recipient turn on you with a defensive tone? And then days later (or weeks or months) heard or seen that person sharing that very information with someone else or putting it into practice? I have. It is quite gratifying to realize the power of your persuasive words. And when it happens to me, it is almost always a surprise. Depending on the initial response, I typically think I’m not very good at communicating. Misunderstandings happen all too often. Sometimes, even though I’m a better-than-average writer, I think there is no power in my pen at all. When those gratifying moments come, when I realize I did get my point across–that person did hear me and receive my helpful words–I tend to make light of it because of the delayed response. That’s human nature: we focus on the negative and shrug off the positive. So I’m writing down positive words today. A certain person did not like my suggestion about how to put the liner in the trash can. That person defensively told me he had his own way of doing it. This week that adorable person put the liner in correctly (i.e. the way I suggested) and my faith in the mighty power of persuasive words has been restored. That said, and believed, and recorded, (and laughed about) we ought to be careful with words, both those we speak and those we hear. Words have brought down nations, started wars, ended wars and dissolved marriage vows. The words we allow in our heads can build us up or tear us down. They’ve even been known to drive a person to take his own life. Sometimes when we feel torn down at the end of a long day, we simply need to hear some positive, build-up words and remember our successes. A couple of people lately have told me I’m “bubbly,” “always upbeat regardless of circumstances,” and “caring.” I’ve also heard I’m a “good hostess.” I’m writing those down! The Good Lord knows about all the negative ones that will pop in my head from time to time. 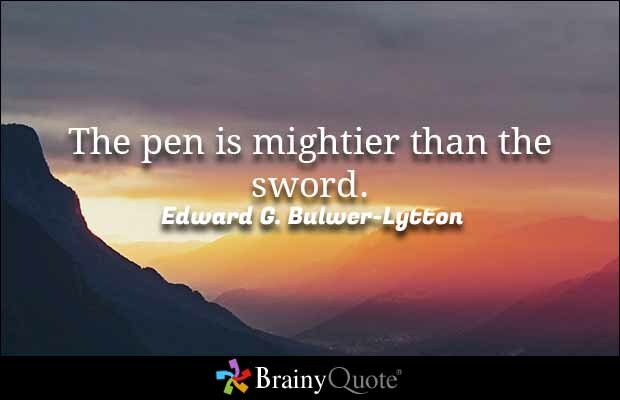 This entry was posted in Short Takes on Life and tagged arguments, communication skills, positive self speak, positive words, power of persuasion, power of words, suicide, The pen is mightier, wars. Bookmark the permalink. To take it a step further, in business sharing a bit of information, no matter how helpful, can become dangerous with recipients who enhance and embellish. I also must allude to pick our battles, who are we to judge, and silence is golden. No need to be in control. What I think is proficient doesn’t mean someone else’s methods are not equally so, or at the very least, efficient. Copy cats could be considered complimentary. Thanks for your feedback! Not sure what you intended about copy cats? To explain about the trash can liner–it’s a Simple Human and if you don’t put the liner in “a certain way” it falls down and “somebody” has mess to clean up! LOL. ‘Preciate you!